The Curtis G4 1-Gallon could easily represent the peak form of electronics before they reach full sentience. How does it make such delicious coffee without the ability to taste it? With options to select your coffee from six different recipes, your morning brew will be crafted with consistency to extract the finest flavors possible. 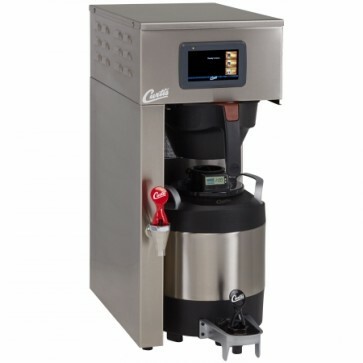 The Curtis G4 1-Gallon Brewer offers full control over temperature, pulse timing, pre-infusion, brew volume, water bypass, and custom recipes. This brewer also comes with the capacity for self-diagnostics of internal issues, allowing you to test for concerns at any time. In addition, you can easily program your machine to fall asleep when you do with its automatic eco-mode. 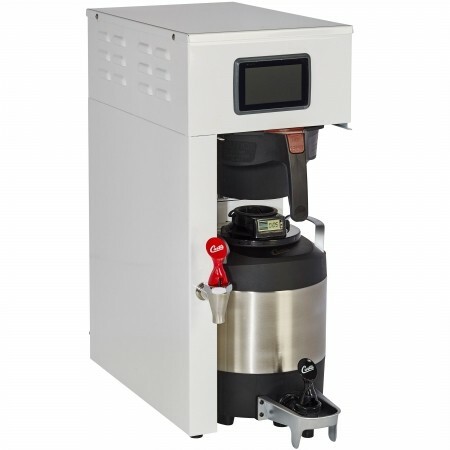 Options to set your brewer to a low temperature overnight will cut morning prep time in half, or you can choose to have the machine turn itself off completely after four hours of non-use. Curtis G4 Brewers: So well made you’ll wonder if there’s a tiny human inside. 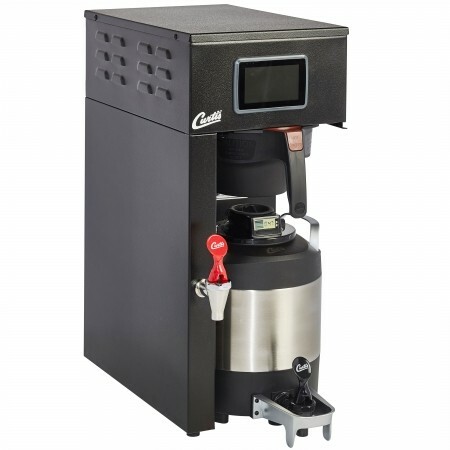 Catch the Curtis G4 1-Gallon Brewer before it becomes self-aware! Touch Screen - Fresh brewed coffee is just a tap away, with this quick loading interface and single-step start button. Personal Recipes - Fine-tune your coffee to taste even better than you thought it could, with the precise controls and settings of recipe programming. USB Port - Convenient USB port lets you effortlessly back-up recipes and install fresh software updates. Energy Saving Mode - Cut down on energy usage without even giving it a second thought, with the Curtis G4 Automatic Energy Mode settings. Built in Self-Diagnostic System - Always stay on the up-and-up with your machine–easily find out how things are working inside, even if it’s just for the sake of curiosity. Pulse Brewing - Recipes are fine tuned for pulse-brewing so that your coffee flavors will bloom and extract evenly. Super Customizable! - Every. Little. Thing. Just the way we like it. Save your Files - We put a lot of time and thought into all the recipes we made for our Curtis G4, so being able to save them onto a back-up USB is definitely a relief! User Friendly - The responsive touch-screen and intuitive interface make this brewer really easy to navigate through. Do what now? - Reaching the Settings Menu is a little bit less obvious than we’d like it to be. Designed so that it can only be reached after pressing the Curtis logo 5 times and then entering a 4-digit password means that your settings are always secure, but also kind of a pain to adjust. Enabler - A lot of the fun features are set to "Disabled" when your machine is fresh out of the box–so be sure to check out that Settings Menu! Doesn't come with a serving pot - That one's a quick fix though. Click here to grab yours!